Alfredo “Freddy” Valencia ’14 in the Kadoch Laboratory, which is dedicated to creating innovative ways to investigate and target human cancers. 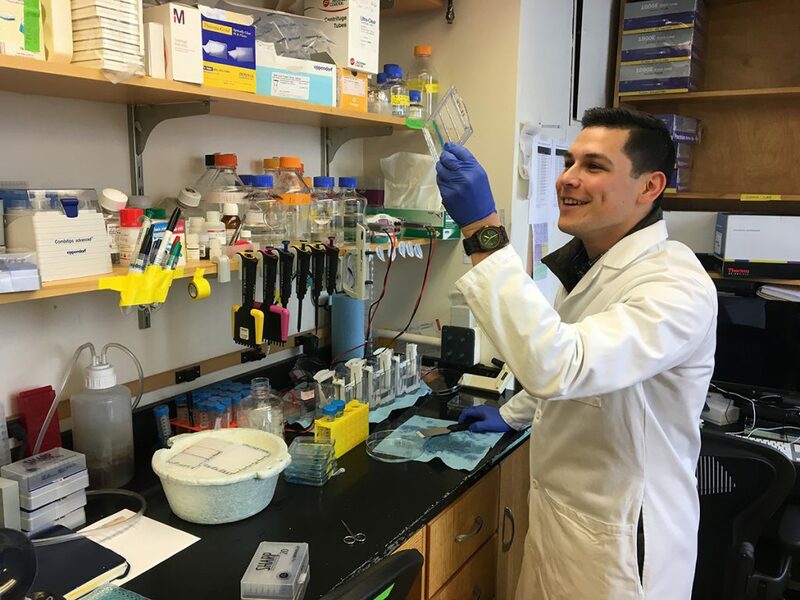 Claremont, Calif. (January 23, 2019)—Pitzer College alumnus and Harvard University graduate student Alfredo “Freddy” Valencia ’14 co-authored a review article for the 20th anniversary edition of the journal Nature Cell Biology. Valencia’s article, “Chromatin regulatory mechanisms and therapeutic opportunities in cancer,” was commissioned by Nature Cell Biology, which is published by the same company that produces the international science journal Nature. Valencia, a first-generation college student who majored in biochemistry at Pitzer, is pursuing his PhD in chemical biology at Harvard. He wrote the article with his thesis adviser Cigall Kadoch, a professor at the Dana-Farber Cancer Institute and Harvard Medical School who Forbes calls “one of biology’s rising stars.” Valencia is a predoctoral fellow in the Kadoch Laboratory, which is dedicated to creating innovative ways to investigate and target human cancers. Their Nature Cell Biology article reviews recent research about chromatin—the structure of DNA and protein within the nucleus of each cell—and the link between the disruption of chromatin regulatory processes and cancer. In the article, Valencia and Kadoch also explore new approaches to cancer treatment that draw on scientists’ ever-improving understanding of chromatin organization and regulation. “With a broad scope of research covered, Professor Kadoch and I hope this is interesting to those in our field as well as others interested in learning more on the topic,” Valencia said. Valencia’s research at Harvard focuses on the biochemical and epigenetic underpinnings of genetic mutations that develop into human disorders and diseases, such as cancer. In 2017, he co-authored an article for Nature Genetics on a rare soft tissue cancer and one of the most aggressive pediatric cancers. He was also awarded a Ford Foundation Predoctoral Fellowship, a Howard Hughes Medical Institute Gilliam Fellowship and a Hispanic Scholarship Fund scholarship. Last year, Harvard Graduate School of Arts and Sciences’ Office of Diversity and Minority Affairs selected Valencia as one of two inaugural diversity fellows. At Pitzer, Valencia was a McNair Scholar as well as a research assistant at the W.M. Keck Science Department, where he worked in Associate Professor of Chemistry Aaron Leconte’s lab. He also credits chemistry professors Mary Hatcher-Skeers and Katie Purvis-Roberts with playing essential roles in sparking his interest in pursuing a biochemistry degree at Pitzer.